Explore the magnificent Mayan archaeological sites of Lamanai, Xunantunich, Cahel Pech, and Tikal while also enjoying abundant birding opportunities, lush rainforests home to unique wildlife, a seven mile beautiful beach along the Caribbean Sea and snorkeling among the coral reefs rich with vibrant marine life. Have the opportunity to experience the Mayan and Garifuna culture of today, visit museums, and meet with local experts, including archaeologists, conservationists, and artisans. Experience the best Belize and Guatemala has to offer while staying at selected eco-lodges owned and operated by local residents. Discover the country’s pre-Columbian history at Maya archaeological sites like Xunantunich, Cahal Pech, and Lamanai ruins. Receive a site lecture from an archeologist on Maya History and the Management of Cultural Heritage in Belize. Look for colorful fish, sea sponges, stingrays and other marine life during a snorkeling excursion at South Water Caye Marine Reserve on Belize’s Barrier Reef. Your tour leader, Penny Jarrett has over 25 years of experience in environmental education, wildlife conservation, field work, archaeology and leading group tours. Penny has traveled extensively and more specifically to Belize and Guatemala multiple times to assist with manatee research, provide education programs in local villages, help with medical missions, study Belizean wildlife and explore Mayan sites. Working for the Cincinnati Zoo & Botanical Garden, her interest in primates took her to the Republic of Congo to conduct research on the Western lowland gorilla, forest elephant, and other wildlife. 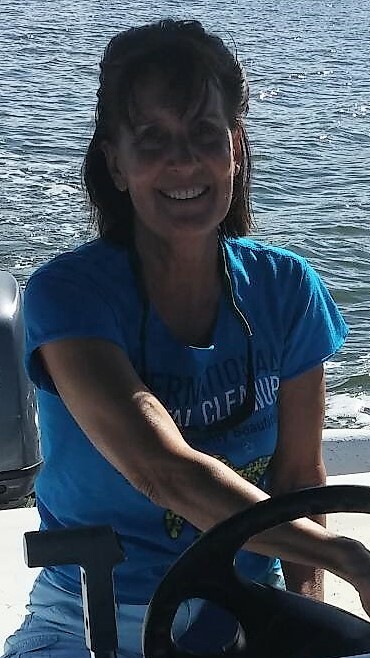 She has worked for the Florida Fish & Wildlife Conservation Commission to monitor nesting shorebirds and has been an avid birder for many years. Penny is currently the Education Coordinator at the Mound House, a museum that is located atop of a 2,000 year old Calusa Indian archaeological site in Fort Myers Beach, Florida, which provides hands-on learning experiences about Florida’s human history, wildlife and natural environment. Upon arrival in Belize, transfer from the airport to Bird’s Eye View Lodge, located in Crooked Tree Wildlife Sanctuary on the edge of the Crooked Tree Lagoon. In order to use the group transfer you must arrive into Belize no later then 1:30pm. If you arrive after this time you will need to pay for a private transfer. The Village of Crooked Tree sits on an Island of about 20 square miles and the lagoons and the marshes of the sanctuary cover over 12,800 acres; the area is considered one of the best birding spots in Belize. After settling in receive a program orientation and then a guided birding walk around the lagoon. This evening attend a presentation on Belize and Mayan history. This morning travel by boat up the New River to the Maya ruins of Lamanai, with birding along the way. Lamanai, whose name means "submerged crocodile," was once a prominent ceremonial center of the Maya civilization. The surrounding forest is home to hundreds of species, such as the Collared Aracari, Snail Kite, flycatchers, and tanagers. After exploring the ruins enjoy lunch and then return to the boat for the journey back to Crooked Tree. Later in the day take boat ride on the lagoon for birding. Over 300 resident or migrating birds commonly seen around the Lodge and along the nearby Lagoons and Trails. Depart early this morning and visit the Community Baboon Sanctuary (CBS). The CBS started when 12 local farmers and landowners pledged to preserve the area’s black howler monkey habitat, hoping to increase eco-tourism and support the local economy. Today more than 200 landowners in seven villages participate in the program and the monkey population has grown to over 2,000. Upon arrival at the Sanctuary visit the small museum to learn about the program and then take a guided hike in search of monkeys. After your visit head to San Ignacio for lunch and a visit to the Tanah Maya Art Museum. Next, head to the Cahal Pech Ruins and meet with Antonio Beardall an archeologist with the National Institute of Culture and History, who will give a talk on the "Management of Cultural Heritage" in Belize. Explore the ruins with Mr. Beardall who has been working on excavations of the site for over five years. His experience and insight will give you a unique opportunity to learn about the Maya. The site consists of seven plazas and over 30 structures including temples, residential buildings, ball courts, an altar, and a sweat-house, all situated on just two acres. Later in the day transfer to Chaa Creek Lodge set along the banks of the Macal River in a 400 acre private reserve at the foothills of the Maya Mountains. After breakfast visit the ruins of Xunantunich, Belize's most accessible Maya site of significance. The site's dominant structure, El Castillo, rises 130 ft. above the jungle floor, offering superb views of western Belize with forest stretching out all around and the rest of the ancient city mapped out beneath you. After exploring the ruins return to lodge for lunch and then in the afternoon visit the 33 acre Maya Organic Farm, an integral part of the Chaa Creek Reserve which provides freshly harvested produce for the lodge. The farm integrates traditional Maya farming with more advanced systems of irrigated raised beds of composted soil fed with nutrients derived from natures store house. Few people, including native Belizeans, understand the complexity of the Mayas organic farming techniques. The indigenous Maya have survived for over 2000 years on subsistence farming for home use, barter, and sale as the backbone of their existence. They have used resources supplied by nature to nourish the soil and protect their crops from insect devastation. Costly chemicals were simply not an option and their continuing methodology has clearly stood the test of time. You get to see all the different fruits and vegetables that are grown and the different organic farming methods with soil enrichment that are used based on a five year rotation plan. Cacao, root crops, and vegetables planted on the farm oftentimes can only be found in the older Mayan settlements. After an early breakfast travel to Tikal, Guatemala located in the Peten lowlands of Guatemala. The journey will include a stop at the border between Belize and Guatemala to undergo immigration/customs procedures. Continue the transfer to Tikal National Park for a guided hike. Hidden deep within the rainforest, the site covers over 25 square miles and contains 3,000 separate structures, some currently under excavation. Learn about Tikal’s most importantarchitectural features and what they have revealed about Classic period Maya culture. At the end of the day have dinner at your hotel, located a just a 10 minute walk from the ruins. After breakfast, travel 30 minutes by boat for snorkeling in the South Water Caye Marine Reserve, travel to the second longest barrier reef system in the Western Hemisphere. While snorkeling in the crystal clear water observe a multitude of coral formations and more than 250 species of brilliantly colored tropical fish. Your guide will swim along with you and point out the many sea creatures that inhabit this massive reef system including lobsters, eels, nurse sharks and several varieties of rays. Return to the lodge for lunch, before heading out to visit a traditional Garifuna village. As you explore the village, experience first-hand the language, food, music, and rituals of the Garinagu people. The Garifuna are descendants of Carib Indians and West Africans who escaped slave ships wrecked off the coast of St. Vincent in 1635. To this day, they have managed to retain most of their culture, customs, and beliefs. End your visit with drumming lessons and lunch. Early this morning transfer to Belize International Airport for your flight home. Please note that departure flights must not depart before 1:00 pm in order to utilize the group transfer. Flights departing earlier will require a private transfer for an additional fee. American and Canadian citizens must have a valid passport to enter Belize and Guatemala. For travel to Guatemala U.S. passports must be valid for at least six months after the date of entry. Canadian passports must be valid for at least six months beyond the date of expected departure from Belize and Guatemala. A visa is not required for visits up to 30 days in Belize and 90 days in Guatemala. When leaving Belize there is a departure tax of approximately $40, which is included in the cost of your ticket if you purchase your airfare through Holbrook Travel. If you are not traveling with a U.S. passport, please check with the countries' respective embassies for the requirements based on your nationality. There are no vaccinations required for entry into Belize, Guatemala, or Honduras, unless you are arriving from an endemic yellow fever area, in which case all three require a yellow fever vaccine. Some physicians recommend that travelers get hepatitis A and typhoid vaccines before visiting Belize, Guatemala, and Honduras. Locally transmitted cases of chikungunya have been reported in Belize, Guatemala, and Honduras. Local transmission means that mosquitoes in the area have been infected with chikungunya and are spreading it to people. The CDC recommends that travelers to Central America take the usual precautions to protect themselves from mosquito bites. Locally transmitted cases of Zika virus have been reported in Belize, Guatemala, and Honduras. Local transmission means that mosquitoes in the area have been infected with Zika and are spreading it to people. The CDC recommends that travelers to Belize, Guatemala, and Honduras protect themselves from mosquito bites. As a precaution, the CDC advises women who are pregnant to consider postponing travel to any area where Zika virus transmission is ongoing. Everything was absolutely amazing. Even though we only had one week, it felt as though we accomplished so much and really saw the Belize cultures and history.